For other uses, see Amistad. ^ "Amistad Reservoir". Texas Parks and Wildlife Department. Retrieved 29 May 2015. ^ Froese, Rainer and Pauly, Daniel, eds. (2006). "Gambusia amistadensis" in FishBase. May 2006 version. ^ "AMISTAD RESERVOIR". Handbook of Texas Online. Texas State Historical Association. 9 June 2010. Retrieved 28 May 2015. 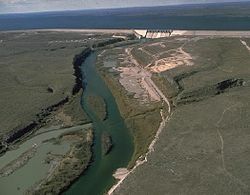 Wikimedia Commons has media related to Amistad Reservoir.